Some years I have blogged every day from the Sewanee Writers’ Conference. Not this year, obviously. I’ve been busy. The main reason for that is that I’m more or less doing TWO workshops instead of the usual one. Not only am I doing the reading and critiquing for my playwriting workshop (with Dan O’Brien and Daisy Foote), I’m also attending (and doing most of the reading for) a workshop with Tim O’Brien and Christine Schutt. That’s one of the best fiction workshops I’ve ever seen, so I don’t regret it for a minute. Wow. But to back up a little . . . This year, instead of driving here myself, I caught a ride with two other conference-goers. Not only was that a good thing to do ecologically, it made the time go by fast. Before I knew it, we were in Sewanee checking in and getting settled into our dorms. The opening night reading was given by Alice McDermott from a work in progress. It was in the same vein as her earlier work, and it was just as beautiful. On the second day, we had a craft lecture by Jill McCorkle on finding a balance between the public and private lives of our characters and ourselves. That was followed by Mark Strand, who talked about the poetry of Carlos Drummond de Andrade, including a particular poem, “In the Middle of the Road.” That afternoon we had a beautiful (if somewhat melancholy) reading by Robert Hass, and that night we had a reading by Tony Earley (from a story that I think he read a different section of the last time I was here). Along the way, I got to reconnect with Tim O’Brien, whom I hadn’t seen since our workshop here in 2008. The next day we had a great Fellows’ Reading with Elliot Holt, Joshua Robbins, and Teddy Wayne. I confess that I skipped the editors’ panel that followed, but I returned for Richard Bausch’s craft lecture. It was a pleasant hodgepodge that could be summarized thusly: “Fiction is not life; it’s a semblance of life.” Wyatt Prunty read poetry that afternoon and that evening we heard from Jill McCorkle’s latest novel, Life After Life. On Friday we began the staff readings with Dan Groves, Adam Vines, and Caki Wilkinson, followed by an editors’ panel with Mary Flinn (Blackbird), Roger Hodge (Oxford American), John Irwin (Johns Hopkins Review), and Philip Terzian (The Weekly Standard). Then Robert Hass gave his craft lecture, which was amazing considering that he left his notes in his cottage! The subject was the origins of modernism in poetry and he talked about Gertrude Stein, Marianne Moore, and H.D. It was simply brilliant. Later in the afternoon Tim O’Brien gave a reading. We heard “How to Tell a True War Story,” which is one of the great pieces in his book The Things They Carried. Tim got a well-deserved standing ovation for his emotional reading. Just fantastic stuff. That night, Daisy Foote put on a staged reading of a scene from her new play–rough around the edges, as she admitted from the start. Still, very interesting to see such raw work. On Saturday morning, we heard from fellows Shannon Cain, Katy Didden, and Pete Levine. I skipped an agents’ panel, but then we had a fantastic craft lecture by Mary Jo Salter on Imagery and Exposition in Poetry–wonderful stuff and applicable to fiction, too. That afternoon, Andrew Hudgins gave a reading, mostly from his new memoir. And that night Richard Bausch read. I’d expected him to read from his recently finished novel, but instead he read a story from his Collected Stories. It was wonderful. That brings us to Sunday, and a morning of rest for me. I’ll continue with Sunday afternoon in a subsequent post. p.s. 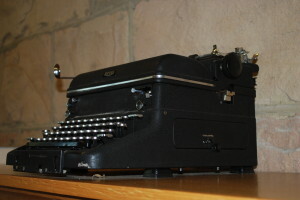 The typewriter pictured above is in the University Archives and is, apparently, the very typewriter used by Tennessee Williams.